Playa del Carmen was originally a small fishing town. Tourism came to Playa del Carmen with the passenger ferry service the the island of Cozumel, a world famous scuba diving destination. While passing through, many people realized that it was a nice place to relax away from the crowds of Cancun but with the same quality beaches and turquoise waters. 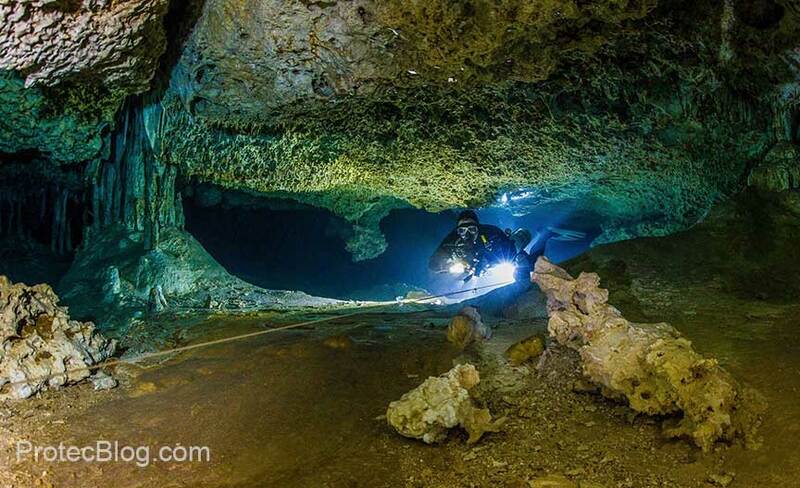 Perhaps just as impressive as Cozumel, Playa del Carmen’s coast offers good scuba diving opportunities, as well as the cenote and cave diving for the more adventurous. Today Playa del Carmen, or just “Playa” as it is referred to, is the center of the Rivera Maya, which runs from south of Cancun to Tulum and the Sian Ka’an biosphere reserve. Playa is a stop for several cruise ships which dock at the nearby Calica quarry docks, about five miles / 8 kilometers south of the city. A Mexican themed “eco-archaeological park”, Xcaret (pronounced “esh-caret”) is a popular tourist destination just south of the town. Tourist activity in Playa del Carmen centers on Quinta Avenida, or Fifth Avenue, stretching from calle 1 norte until calle 34, a pedestrian walkway located just one block inland from the beach which is lined with boutique hotels, shops, bars, and restaurants. Elements within the Playa del Carmen local community and government have attempted to retain Playa del Carmen’s reputation and charm as a small fishing village and artists’ colony, without it becoming as large or tourist dependent as Cancún. To this end, the city passed an ordinance limiting buildings to three stories. A few four story buildings were built before the ordinance, however, Playa del Carmen is currently expanding north beyond the Colosio section and on the other side of highway 307, the Ejido. Playacar is a residential and tourist development in Playa del Carmen, just south of the main urban area, where most of the all-inclusive hotels, the aviary, and the golf course are located. Playacar is privately owned. There is a significant European influence in Playa, with a number of local business proprietors drawn from the European community. In October 2005 Hurricane Wilma passed directly over Playa del Carmen, remaining in the vicinity for two days and causing significant damage and a temporary drop in tourist arrivals. Fortunately most of the damage was relatively superficial and repaired within a few weeks of the storm. Hurricane Wilma arrived from the Caribbean sea, passing over the island of Cozumel before making landfall in Playa del Carmen. It then moved north along the Mexican coast, hitting Cancun especially hard. Playa del Carmen is named for Our Lady of the Mount Carmen, who is the patron saint of Cancún. The first recorded visitors to the beaches of what is now Playa del Carmen came during the Early Classic Period (a.d. 300-600) of the Mayan civilization. Then called Xaman-Ha, or “waters of the north,” Playa del Carmen was a rest stop of sorts for travelers making their way from the great cities of the Mayan world to the island of Cozumel. The coast and lowlands of the Yucatan peninsula were still heavily populated with the descendents of the fallen civilization when the Spaniards arrived. Tulum with less than an hour travel time south of Playa, was the last Mayan outpost and there are plenty of small ruins in Playa del Carmen. The Spanish focused their attention around the area of Mérida, where conditions were better for growing henequén (sisal), a fibre used to make rope. During the 17th and 18th centuries, the Caribbean coast was considered a savage place with not much to offer for potential settlers.